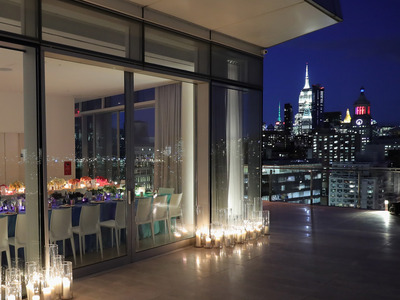 Getty ImagesNew York City has a surplus of penthouse apartments on the market. These days, many richNew Yorkers don’t seem to care about the prestige of living in a penthouse apartment. And these days, “not everyone needs a penthouse to feel like they got the trophy,” Reba Miller, a broker at Berkshire Hathaway HomeServices, told The Real Deal. Agents are increasingly willing to consider offers well below the asking price, Haber told The Real Deal. Beyond oversaturation, the glut of penthouses may suggest that the way New Yorkers view luxury real estate is changing. A penthouse in an older building may not attract buyers the way a unit in a lower floor in a newer building with exciting amenities might, according to Miller. “You can go to many buildings, buy on a lower floor, and feel like you bought the penthouse,” she said. For Haber, penthouses haven’t necessarily become less of a trophy – there are just too many of them. But views may not always be enough given the high price tags of some penthouses. To sweeten the deal for an $US85 million penthouse in Manhattan’s Hell’s Kitchen neighbourhood that’s been on the market for at least two years, the building’s president threw in perks including a $US1 million yacht, a one-year vacation rental in the Hamptons, two Rolls-Royce Phantoms, and even two tickets for a trip to outer space. It has not yet sold. Some buyers may be confused these days about what even constitutes a penthouse. A penthouse in New York City’s tallest residential building has been listed for $US82 million for least two years – and it’s not even on the top floor. In fact, the top six floors of 432 Park Avenue are considered penthouse units because they have different layouts than the other floors and some units occupy an entire floor, a representative for the building told Business Insider. “The days of the penthouse being the top floor are long gone,” Haber said. “Developers have realised there is a premium to be paid for the top floors of a building to have the penthouse moniker.” In some cases, an apartment is called a penthouse not because it’s on the top floor but because it has a different layout, higher ceilings, or other amenities that differentiate it from other units in the building, he said. But even if a unit is not on the very top floor, buyers are attracted to the fact that higher floors tend to have fewer units, James Morgan, an agent at Compass, told Business Insider. For others, the eternal draw will be “the exclusivity of pushing the only PH button in the elevator,” Morgan said.